Fresh crabmeat will make these crab cakes taste even better. With packaged crab, if the meat smells clean and fresh when you first open the package, skip steps 1 and 4 and simply blot away any excess liquid. 1. Place crabmeat and milk in bowl, making sure crab is totally submerged. Cover and refrigerate for at least 20 minutes. 2. Meanwhile, place ¾ cup panko in small zipper-lock bag and finely crush with rolling pin. Transfer crushed panko to 10-inch nonstick skillet and add remaining ¾ cup panko. Toast over medium-high heat, stirring constantly, until golden brown, about 5 minutes. Transfer panko to shallow dish and stir in ¼ teaspoon salt and pepper to taste. Wipe out skillet. 3. Pulse celery, onion, and garlic in food processor until finely chopped, 5 to 8 pulses, scraping down bowl as needed. Transfer vegetables to large bowl. Rinse processor bowl and blade and reserve. Melt butter in now-empty skillet over medium heat. Add chopped vegetables, 1/2 teaspoon salt, and 1/8 teaspoon pepper; cook, stirring frequently, until vegetables are softened and all moisture has evaporated, 4 to 6 minutes. Return vegetables to large bowl and let cool to room temperature. Rinse out pan and wipe clean. 4. Strain crabmeat through fine-mesh strainer, pressing firmly to remove milk but being careful not to break up lumps of crabmeat. 5. Pulse shrimp in now-empty food processor until finely ground, 12 to 15 pulses, scraping down bowl as needed. Add cream and pulse to combine, 2 to 4 pulses, scraping down bowl as needed. Transfer shrimp puree to bowl with cooled vegetables. 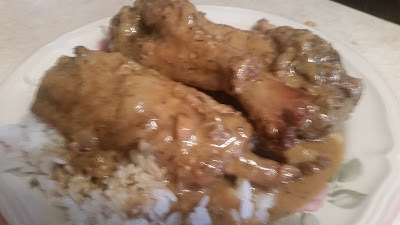 Add mustard, hot pepper sauce, lemon juice, and Old Bay seasoning; stir until well combined. Add crabmeat and fold gently with rubber spatula, being careful not to overmix and break up lumps of crabmeat. Divide mixture into 8 balls and firmly press into 1/2-inch-thick patties. Place cakes on rimmed baking sheet lined with parchment paper, cover tightly with plastic wrap, and refrigerate for 30 minutes. 6. Coat each cake in panko, firmly pressing to adhere crumbs to exterior. Heat 1 tablespoon oil in now-empty skillet over medium heat until shimmering. Place 4 cakes in skillet and cook without moving them until golden brown, 3 to 4 minutes. 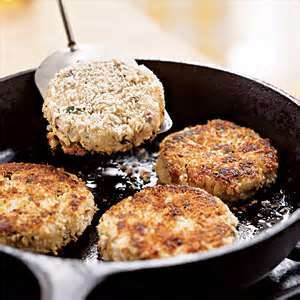 Using 2 spatulas, carefully flip cakes, add 1 tablespoon oil, reduce heat to medium-low, and continue to cook until second side is golden brown, 4 to 6 minutes. Transfer cakes to platter. Wipe out skillet and repeat with remaining 4 cakes and remaining 2 tablespoons oil. Serve immediately.